In a Nutshell: The recruiting, hiring, and onboarding process often means expensive advertising, stacks of resumes, and a splitting headache. But, it doesn’t have to. Greenhouse offers a suite of tools designed to make the hiring process a more efficient, effective, and pleasant experience, even past the hire date. The cloud-based platform provides recruiting tools that help find the perfect candidates, interview kits that ensure consistent, structured feedback, and an onboarding process that puts the focus on what matters most: defining company culture, finding the right fit, and welcoming new teammates. The typical recruiting process looks something like this: A hiring manager takes the time to craft a job ad, spends upwards of $2,000 posting it on the top five online job boards, and then becomes inundated with applications. Every day the hiring manager reads through stacks of resumes and, trusting that the applicants are as good as they’ve made themselves sound, schedules interviews. The interview process then presents additional challenges as any inconsistency can make candidate comparisons difficult. After making a decision, companies then prepare for onboarding a new hire, striving to maximize productivity. The recruitment and hiring process can be daunting, expensive, and extremely time-consuming. Often, after it’s all over, companies are left wondering if there’s a better way. Greenhouse aims to make the addition of new staff members a simple and smooth process. Its platform offers a suite of tools designed to make hiring a more efficient, effective, and pleasant experience, even past the hire date. Greenhouse simplifies hiring and onboarding so a company can focus on a rich culture. 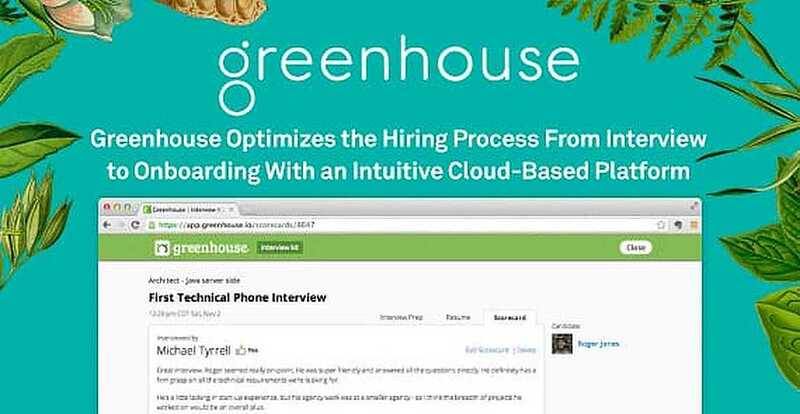 Used by companies like AirBnB, Pinterest, and Vimeo, Greenhouse software optimizes the entire recruiting process. It helps businesses find better candidates, conduct more focused interviews, and make data-driven hiring decisions. Then, after the hire, Greenhouse onboarding guides companies to provide new employees with everything they need to be successful on day one. Greenhouse sees hiring as meeting a need, not just filling a seat and believes every aspect of the process should be tailored to the person a business hopes to bring aboard. Sourcing, job ads, interview structure, evaluation criteria — all of it flows from a broad, holistic vision of the ideal candidate. Without a clear plan for every interview, things can get off track quickly. A structured interview process will ensure all interviewers are on the same page and will deliver the detailed candidate feedback needed to make the right decision. Greenhouse offers a customized interview kit that provides a world of information about the applicant, and the software can make the interview information available to anyone in the organization who needs it. Each kit outlines the purpose of the meeting, the interview questions, specific job details, and the candidate’s resume. It creates a seamless process for both the interviewers and interviewees. With Greenhouse’s comprehensive interview dashboard, every aspect of the process is well-documented. The interview kit ensures interviewers supply consistent, structured feedback via a candidate scorecard, which is a list of must-have qualities in one simple document created with Greenhouse before the interview process. These must-haves include everything from technical skills and qualifications to traits that will make them a good cultural fit for the organization. Scorecards help guarantee useful, focused feedback from an interview. They also provide flexibility among the hiring team. If a staff person needs to bow out of a subsequent interview, someone else on the team can be just as prepared with the interview kit and scorecard. The scorecard is divided into three main areas: key takeaways, custom questions, and overall recommendation. In the key takeaways section, the interviewer records his or her overall impressions of the interview as well as any pros, cons, strengths, and weaknesses. The custom questions section ensures a business is getting all the information it needs post interview. Custom queries work hand-in-hand with the interview prep section and help interviewers focus on the right questions during the interview. 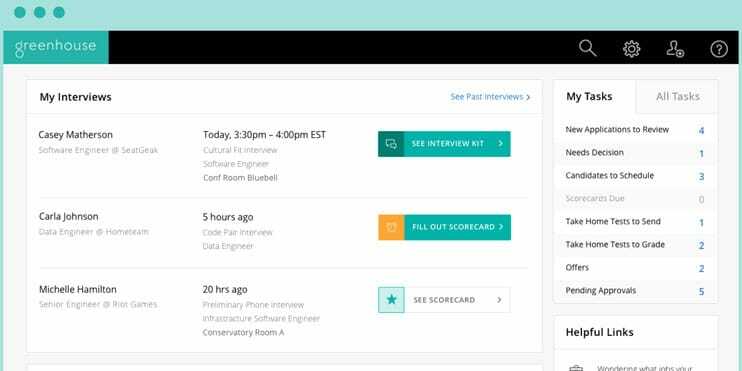 By using scorecards, Greenhouse can provide actionable data on every interviewed candidate. Scoring on these particular questions is straightforward with only five options to keep feedback consistent — a thumbs up, thumbs down, neutral, negative, or standout star. If the interviewer wants to expand on their rating, there’s a notes section for each question. Finally, there is the overall recommendation section. This area provides a single, actionable data point — an interview pass/fail selection. It’s designed to help move the best candidates through the pipeline quickly. If a candidate passes all the initial questions, they can advance to the next stage of the interview process. If they don’t, they can be sent a rejection email promptly. After completing recruitment and hiring, the equally important onboarding and welcoming processes await. Greenhouse improves a company’s organization and preparation, streamlining onboarding with its proprietary platform, which includes employee records such as contact information and employment history. Studies show that 22% of staff turnover occurs in the first 45 days and 91% of first-year workers stay at companies with an efficient process. A smooth onboarding experience gets employees working at full speed in less time, which contributes to greater overall production and retention of those employees. Retaining employees is not only good for company culture, but it’s also good for a company’s bottom line. According to the Center for American Progress, it costs roughly 20% of an employee’s salary to replace that individual. Since companies are constantly evolving, they need tools that can grow with them. Greenhouse Analytics is designed for businesses that prefer a more flexible, hands-on approach to data analysis. Greenhouse’s system is intended to help scale up from small business to enterprise level and has even helped some companies do just that. For example, as tech company Evernote expanded internationally, they used Greenhouse Analytics to identify and source senior leaders; foster better collaboration across hiring managers, interviewers, and recruiters; gain transparency in the recruiting process; and deliver a thorough candidate experience to secure top talent. With Greenhouse, a company can use analytics to find out exactly where the best candidates originate. Greenhouse Analytics compares applications by source-to-hire rates to ensure sourcing dollars are maximized. Analytics also visualizes trends between offers and new hires to improve the recruiting process and analyzes hiring speed to provide quick closings with candidates. As companies compete for top talent, access to meaningful data and robust analytics is crucial to finding, assessing, and hiring the best candidates. As a business grows, adding new team members should be an exciting time, not another headache waiting to happen. Bringing the right people on board can help achieve a company’s vision. Greenhouse wants to help that vision be realized through a seamless and effective hiring process. Greenhouse OPEN brings recruiting and talent acquisition professionals together to help shape the future of hiring. The company hosts an annual Greenhouse OPEN Conference as well as OPEN Roadshow events in New York, Chicago, and Los Angeles to bring together recruiting, human resources, and talent acquisition experts to provide actionable workshops, hands-on training, and inspiring discussions. As a “Best Places to Work” winner, Greenhouse prides itself on putting into action its own hiring recommendations. Greenhouse wants every company to have the freedom to focus on defining its culture, an important aspect of success. According to an article from Entrepreneur, company culture is no longer just nice to have; it’s a must. Employees want to build a career with companies that have strong values, commitment to the community, and a thriving company culture. Greenhouse provides the services and data that allow a company to build a culture and focus on the human side of the business: its people.